My New Blog and My 5 Year Blog-iversary! Last week marked five glorious years that I’ve been writing this blog – my blog-iversity! 5 year and 860 posts later, I’m thrilled to introduce you to a totally new look (but don’t worry, it’s still the same old me). all wrapped up with a bit of sarcasm and tied with a big red bow. So step right in, take a look around and enjoy. Oh, and since my blog forget to buy me flowers, I’m not talking to it right now. P.S. The amazing Cathy Tibbles of WordPress Barista is the brains behind my new look. I told her what I wanted and she helped me make it happen. Hi Kelly! Congrats on your blogerversity! That’s a lot of posts and a lot of dedication. I love your new sleek look and really enjoying the video tour of your home a couple posts back! You offer your readers so much! Thank you so much Sandy – that video was fun to make. I’ll have to do more! Yes! I’m sure all your readers would love to see more videos! it looks amazing! so so happy for you! Congrats !! On your new blog and happy anniversary . Thank you Pamela – 5 years has flown by! Congratulations Kelly!! How exciting for you and Happy Anniversary! I’ve always enjoyed Eclectically Vintage and I’m sure I’ll enjoy Kelly Elko even more! Change is always good and adventurous! I’m looking forward to all the new and wonderful things you have in store!! Happy anniversary! I like the new look. Oh wow! I misspelled my own last name!!! lol It’s Candy Walsh~haha! So funny Candy! and I agree, change is always an adventure! Glad you like it Pat! It looks so very intriguing and congratulations on your 5 yrs.and i hope it will be 5 more. It’s gorgeous Kelly! Congratulations! And happy blogiversary! Thank you Jamie and hugs to you! 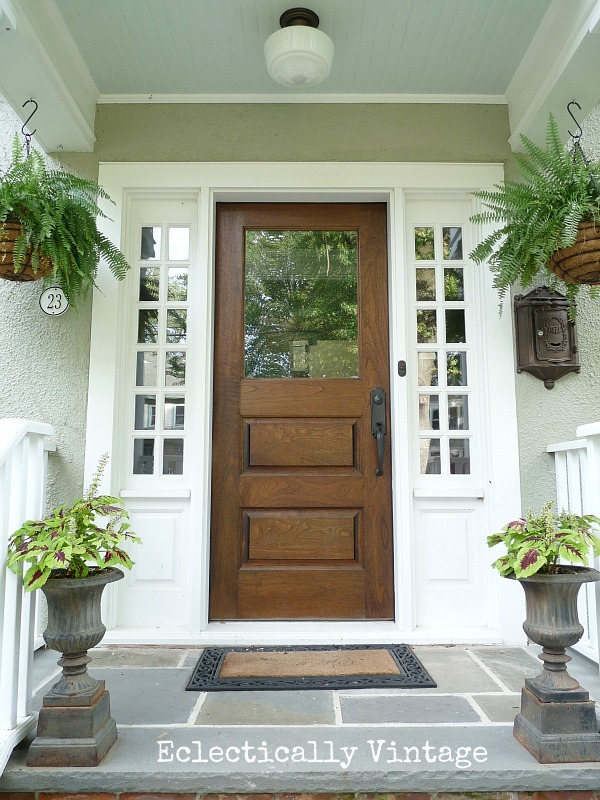 Love your front entrance!!! So charming. Thank you Maggie – it’s small but mighty! Love the new look, Kelly! Yay!! Thank you so so much Amy!! 5 years – I made it Diane! Just stopping in to give you a piece of my mind. I’ve got a pretty great mind and you’ve got a pretty great new blog style. Thanks for that piece of your mind! Please feel free to shower me with compliments any time! I so enjoy your blog. It is beautiful. I am seriously studying your hydrangea information. I hope to get it right some day. I have a love for old (retro) things, also. Over the last few years I have had to go through my 101 year old grandmother’s things and more recently my 99 year old grandmother’s things when she passed to glory. I found my 81 year old father’s baby clothes. Your blog is a highlight of my days. Thank you so much Teresa! I’m so sorry about your loss. It’s hard going through our loved ones things but I’m glad you found your dad’s baby clothes. I’m sure they brightened your day and hold a special place in your heart. Fingers crossed for your hydrangeas! Yup, love it! So beautiful and easy to find everything! Well done! Thank you Tara – so glad you find it easy to navitage! Congrats on five years and the beautiful new blog!! congrats! blog design looks amazing! Love the new look and here’s to 5 more years of blogging! Very exciting, love the new name. So sorry your blog was so insensitive and didn’t send you flowers or chocolates. Hopefully for the 10th year at least. Looking forward to all the beautiful decor served with a slice of sarcasm. We’ve been going to counseling and my blog now knows better! Thank you Karen – here’s to 5 more years of sarcasm! Congratulations and love the new beginning so to speak. Thank you Cindy – it’s so much fun to start fresh!